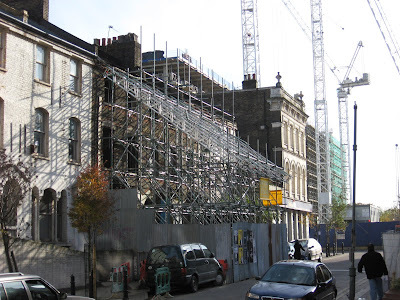 OPEN has learned from demolition contractors on site that four old houses at 2- 8 Ashwin Street must be pulled down and levelled by 5th June because Boris is coming. 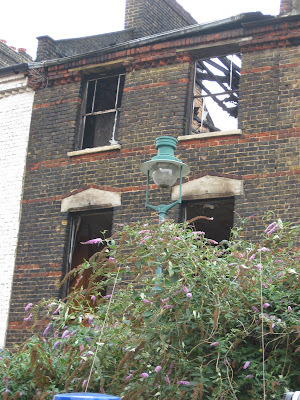 2 Ashwin Street - the ninth "opportunity site" to burn down in Dalston in recent years. A squatter threw himself from an upper floor, during the fire on 31.7.08, with tragic consequences. Hackney has owned the terrace of charming old houses since the 1980s. But it has never maintained or repaired them. It says that their condition has now become so dangerous they must be demolished immediately. There is no time to even consult the public or get planning permission to demolish them. So the timing of the demolitions, by 5th June, is apparently nothing to do with the Council's "Dalston Connected" street party on Sunday 6th June to take place in Ashwin Street. This PR event is to celebrate the Dalston Junction overground station re-opening and Dalston's new £40million Olympic bus stop. Boris is to be the guest of honour. 2-8 Ashwin Street front walls were shored up after the fire, to stablise them, over 12 months ago. But the rear walls got no such protection. In the Council's various public consultations since 2005 onwards our community has expressed a clear preference for re-use of the historic Ashwin Street old houses. Re-use is sustainable and would preserve the human scale and character of Dalston. OPEN, Arcola Theatre and other community groups sent a deputation to Hackney's Mayor, Jules Pipe, on 26th October 2009. His Cabinet agreed "to defer demolition subject to further survey and discussion with interested parties, to determine the feasibility of retention". But there's been no such discussion and Hackney has refused to supply the survey report. But at the same Cabinet meeting, OPEN has discovered, the Cabinet also agreed "that the Council lets the contract for the demolition to Clifford Devlin for the sum of £170K". And over the same period the Council has also been buying up other sites in Ashwin Street, one at over market value, for redevelopment "as a natural progession of the Dalston Square development to the south" . OPEN solicitors have written to the Council demanding to know why the buildings suddenly have to be demolished by 5th June and why no planning application is first to be made and the public consulted. We are grateful for the research assistance of Loving Dalston, the independent Hackney news site. I am sure Boris would see the humor & joy in rotten eggs and tomatoes being thrown at him from the balconies of Dalston. Call to arms aside - where will the next fire be? When are those hundreds of Dalston based 'psycho- geographers' going to tell us to be in order to prevent what can only be criminal fires. Rumour has it that Boris doesn't want anything to do with this "Dalston Conned" PR stunt. But watch out for preening middle aged white men in suits, because they're probably from Hackney Council management and its "partners". And don't forget the rotten eggs and tomatoes.